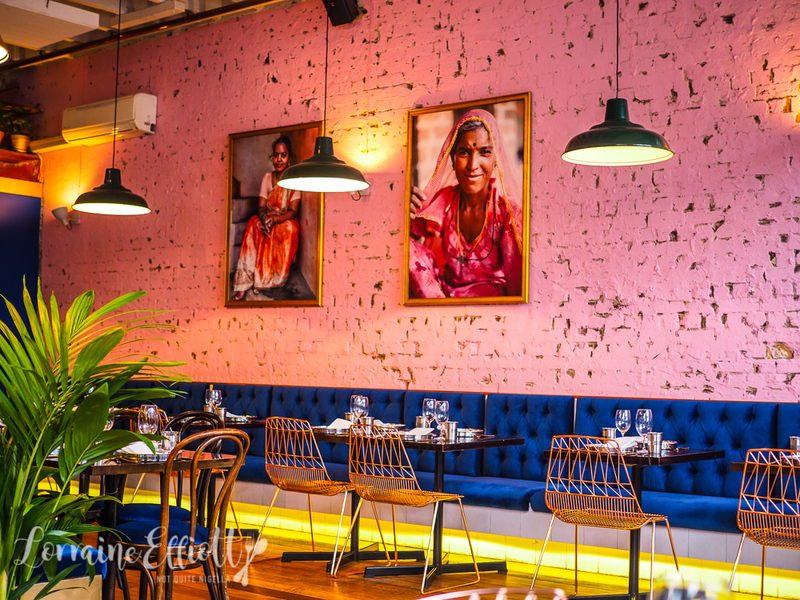 Don't Tell Aunty is a new modern Indian restaurant on Fitzroy street in Surry Hills (replacing 4Fourteen). 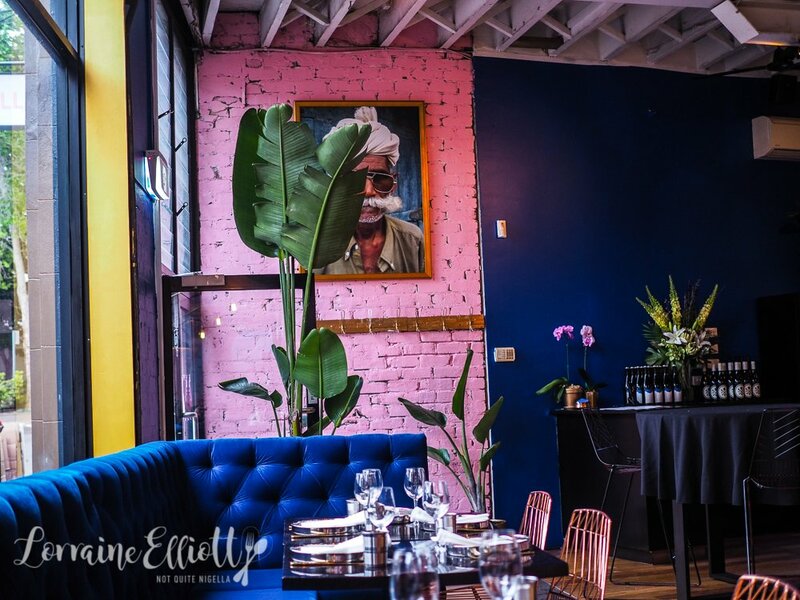 The restaurant is decorated in gorgeous, sumptuous colours with accents of copper and gold. And the menu? Well they proudly proclaim it's "unauthentic Indian". That is, the sort of the classic Indian food that you might tweak and just not tell your Indian aunty about. The Fourth Kardashian sister and I are the second group to arrive at Don't Tell Aunty and we take a seat by the large window. 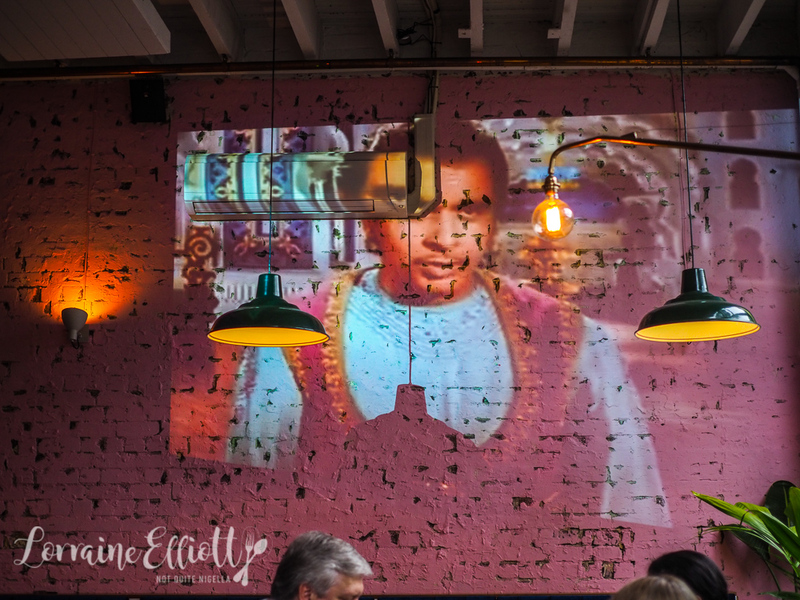 One wall plays Mughal-e-Azam or what our waiter describes as "the best Indian movie ever made". For a change there are no cocktails ordered and we go straight to the food. The uni biryani which intrigued me so much is not available this evening (sad face). The tell tale sign that you've ordered a lot is when the staff quietly start to take cutlery off a neighbouring table to join two tables together. The Fourth Kardashian Sister giggles with delight and for me, it's a regular occurrence. 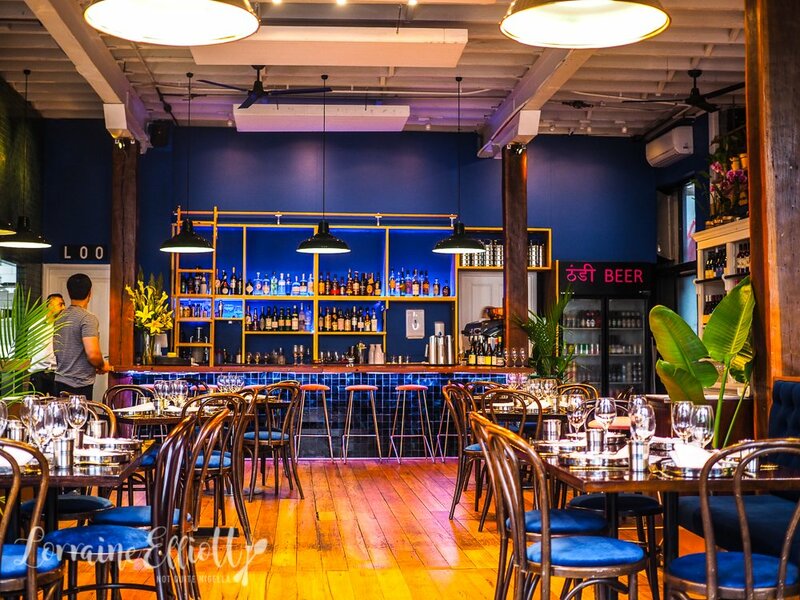 The chef is Jessi Singh who also has two restaurants in America and a place in Melbourne and he is in the kitchen and on the floor tonight. Service here is...very present. Which is not necessarily what we want. We want to have a private, animated discussion and they keep coming back and checking on us. "Would you like the next dish now?" seems a popular refrain and we don't know why they can't just bring it out but they're eager to please and get feedback given it is early days. However every time we get started on talking about something interesting, another staff member pops up to ask if we want a dish cleared, or to check on how something was and by the end we're a bit over it. Probably one of my favourite dishes of the night are the yogurt kebabs or yogurt croquettes. I'd had these at the One Table Supper Club and loved them so much that I made their version of yogurt kebab on my blog. 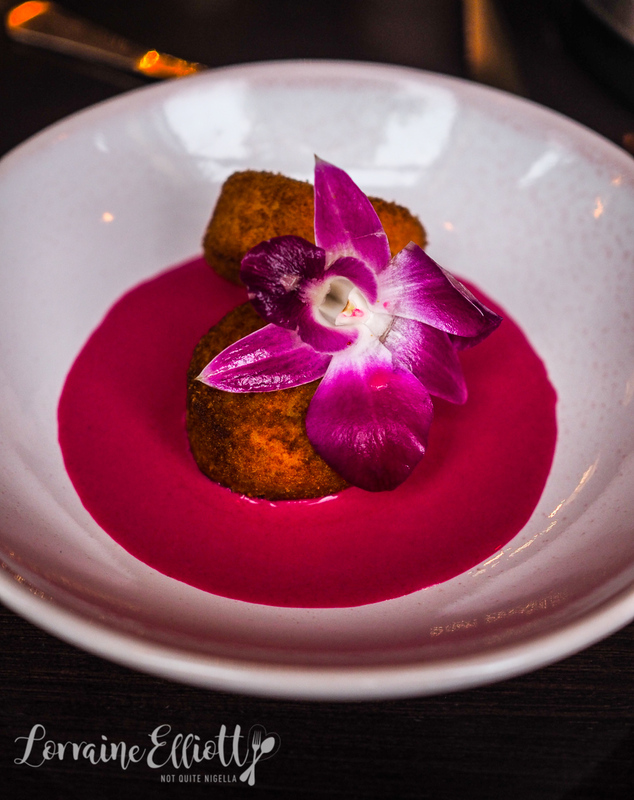 The one here is crunchy deep fried on the outside and it sits in a beetroot yogurt puree. The hung yogurt is rich and creamy and it's strong in ginger and spices. 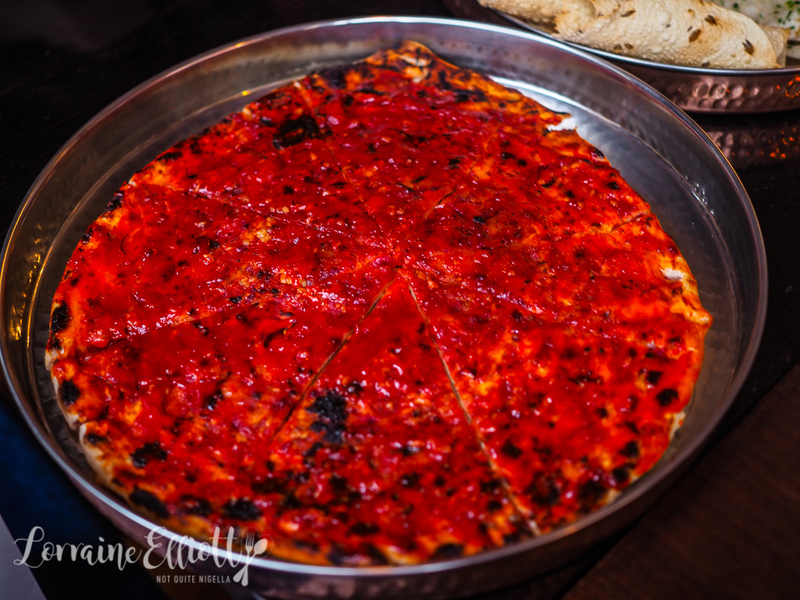 The naan pizza is shaped like a pizza but it is a pizza in the reverse with the blue cheese inside the pizza and the pickled red chilli sauce spread on the outside. I think I was hoping for more, perhaps more cheese or something else. Also the menu does say it is fontina cheese but it's blue cheese used which is an odd substitution considering some people have strong opinions on blue cheese. Sauces are life for me so when presented with an option to try 6 sauces, garlic naan and pappadums we order this. 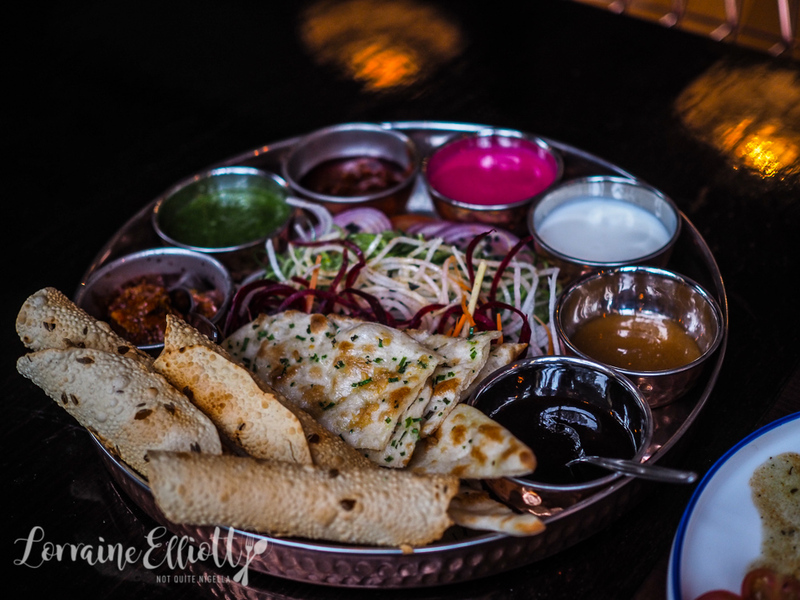 The pappadums are rolled up like cigars and the sauces are: cumin spiced yogurt, hot chilli sauce, tamarind sauce, pickled mango, mint sauce and sweet mango chutney. There's also a tomato and daikon salad in the centre. The garlic naan is nice and garlicky although not as puffy as I really like naan to be, instead it's flatter and thinner. 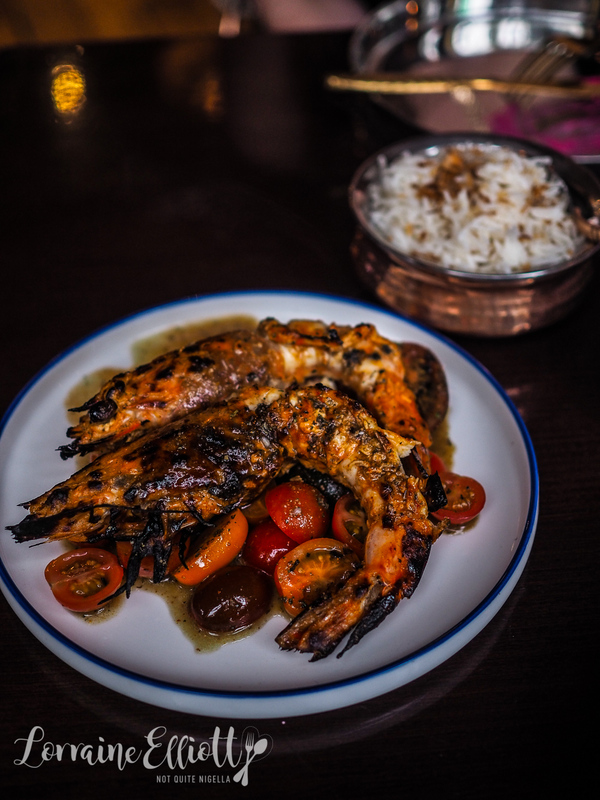 The grilled summer prawn come as two large head on prawns with pineapple and jalapeno chutney. The menu describes them coming with a micro herb salad and again this comes with something entirely different, an heirloom tomato salad which truthfully doesn't suit it very much. I wish with all of the service they had mentioned this to us. We also order this with the aged basmati sella rice very lightly flavoured with cumin and lemon. 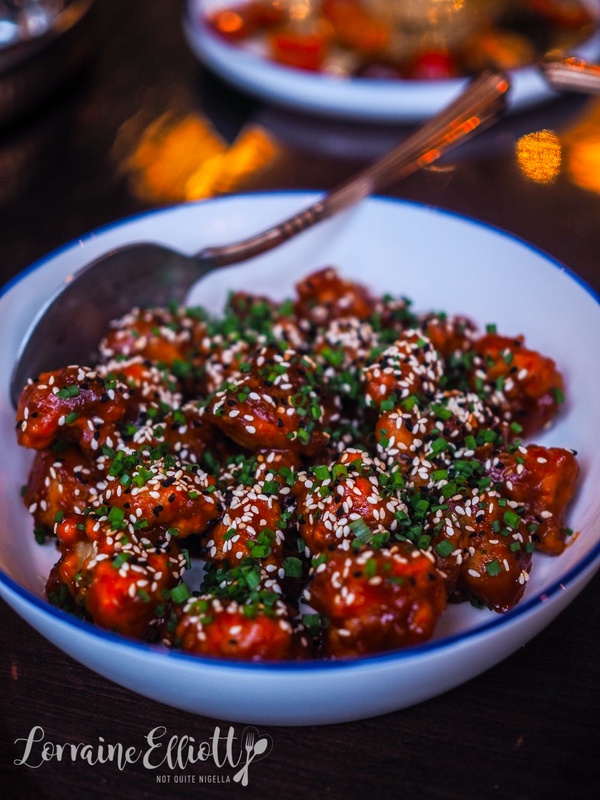 They tell us that one of the most popular dishes is the Colonel Tso's cauliflower which is an Indian Chinese dish (it's a thing, just visit Harris Park) with a spicy, sweet and sour style of sauce. The cauliflower florets are steamed and then deep fried and coated in the sauce and black and white sesame seeds. The serve that we got was not quite as crispy as we had hoped and when they asked us about it we mentioned that the softer texture and they whisked it away and replaced it with a crispier version although still not quite as crispy as I've had before. I think steaming it rather than roasting it first makes it softer and less crispy. The other dish that I liked apart from the yogurt kebabs is the short rib korma which we had to wait for quite a while for. 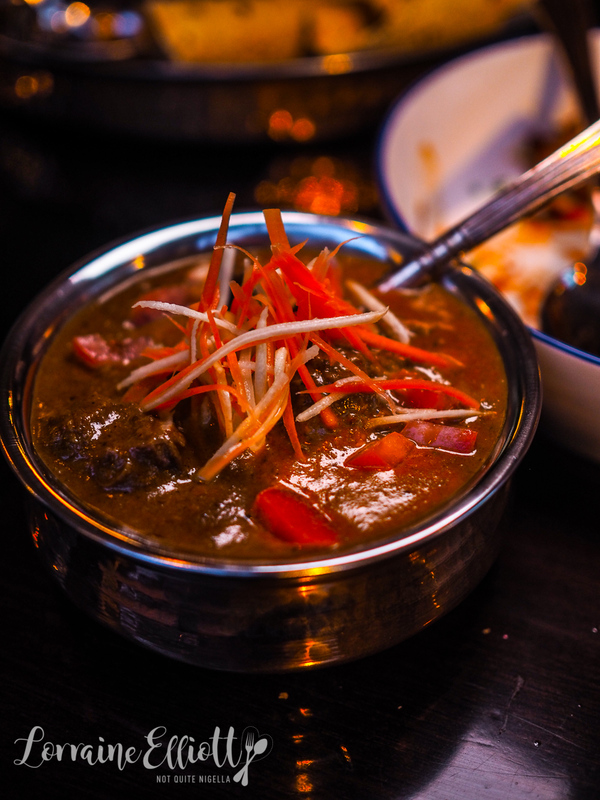 It's a richly sauced cashew nut based curry with soft beef chunks, curry leaves, cardamom, coriander and coconut. Dessert is sent out to us (we noticed another table got complimentary fairy floss) and it's delicious. 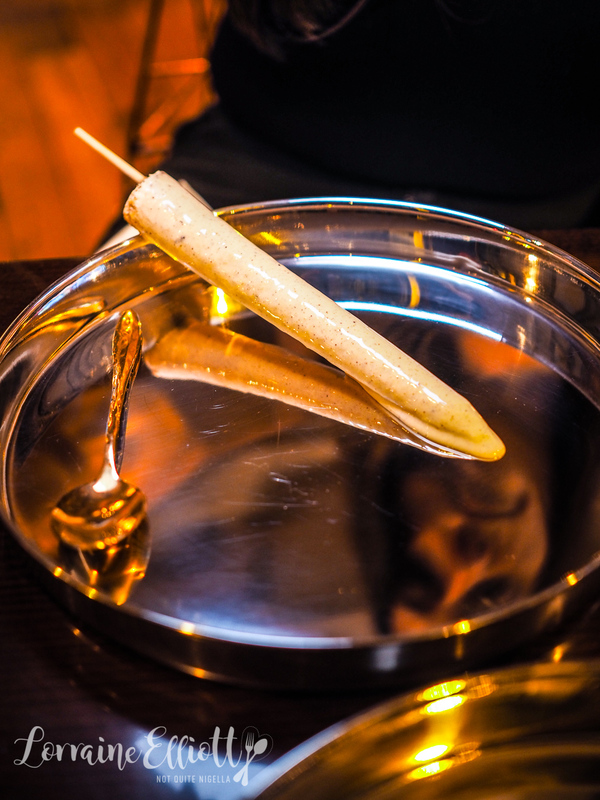 It's a chai and Parle-G biscuit (classic Indian biscuit) kulfi. You do have to eat it quickly as it may fall off the skewer but it's super creamy in texture with just the right amount of chai and finely ground up biscuit. So tell me Dear Reader, which dishes did you like the look of? Have you ever tried Indian Chinese food? And do you like over attentive service or do you prefer to be left a bit alone?